Carlisle scored two first-half goals to beat fellow League Two play-off hopefuls Accrington at Brunton Park. Home skipper Michael Raynes was stretchered off early on with a head injury in a scrappy first period. Carlisle broke the deadlock in the 28th minute when Charlie Wyke slotted home from eight yards following a nicely-worked free-kick. The home side then doubled their lead when Wyke's effort found Alex Gilliead, who drilled home from 12 yards. Match ends, Carlisle United 2, Accrington Stanley 0. 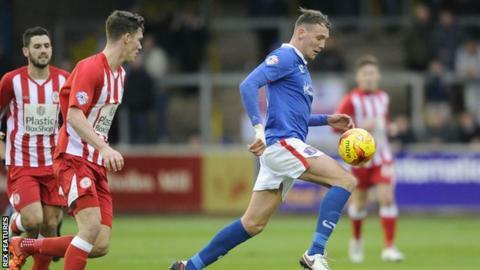 Second Half ends, Carlisle United 2, Accrington Stanley 0. Substitution, Accrington Stanley. Scott Brown replaces Matt Crooks. Corner, Accrington Stanley. Conceded by Mark Ellis. Substitution, Carlisle United. Antony Sweeney replaces Jabo Ibehre. Derek Asamoah (Carlisle United) wins a free kick on the left wing. Attempt saved. Piero Mingoia (Accrington Stanley) right footed shot from long range on the right is saved in the top right corner. Foul by Jabo Ibehre (Carlisle United). Substitution, Carlisle United. Derek Asamoah replaces Alex Gilliead. Attempt missed. Matty Pearson (Accrington Stanley) header from the centre of the box is just a bit too high following a set piece situation. Attempt saved. Liam Wakefield (Accrington Stanley) right footed shot from outside the box is saved in the centre of the goal. Matt Crooks (Accrington Stanley) wins a free kick in the defensive half. Corner, Accrington Stanley. Conceded by Macaulay Gillesphey. Joe Wright (Accrington Stanley) wins a free kick in the defensive half. Substitution, Accrington Stanley. Romuald Boco replaces Shay McCartan. Attempt missed. Billy Kee (Accrington Stanley) header from the centre of the box is just a bit too high. Mark Ellis (Carlisle United) wins a free kick in the defensive half. Corner, Carlisle United. Conceded by Ross Etheridge. Attempt saved. David Atkinson (Carlisle United) right footed shot from the left side of the six yard box is saved in the bottom left corner.